A Balladeer and a Scribe Walk into a Room…. I get requests for all different sizes of pens, yet I continue to be amazed at the number of folk who ask for an oversized pen. Now, my pens tend to be on the large size, anyway, so a Scriptorium oversized pen is really big. Take the Scribe I recently made. The customer asked for it to be oversized and with no step from barrel to threads. That meant the pen would be a little smaller in diameter than the stepped version, but the barrel still ended up at around 16.3mm at the widest point. That’s bigger than a Montblanc 149! The material is a hand poured alumilite called Ocean’s Obsidian Lava Lamp #48, made by Eugene Soto of Muttblanks. His blanks are extremely popular with my customers. The customer chose Black Ebonite for the grip section, a wide Modern clip in silver, and a Black Oxide coated nib. All these colors combined make for an elegant, classy look. Blue materials are always popular. 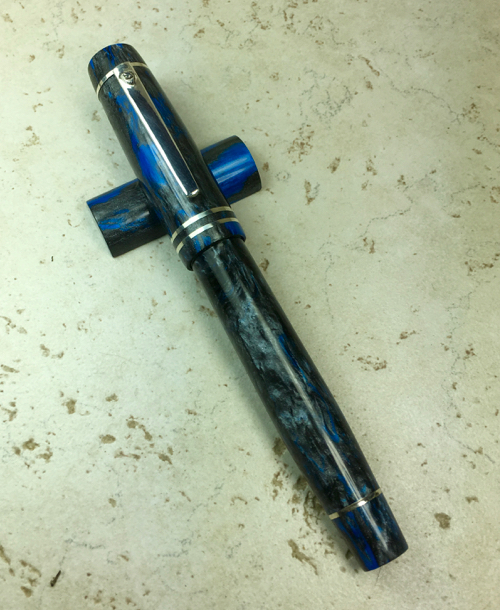 Another blue pen made recently is this large Balladeer made with another hand poured alumilite dubbed “Faux Tibaldi” by its maker, Jonathon Brooks. 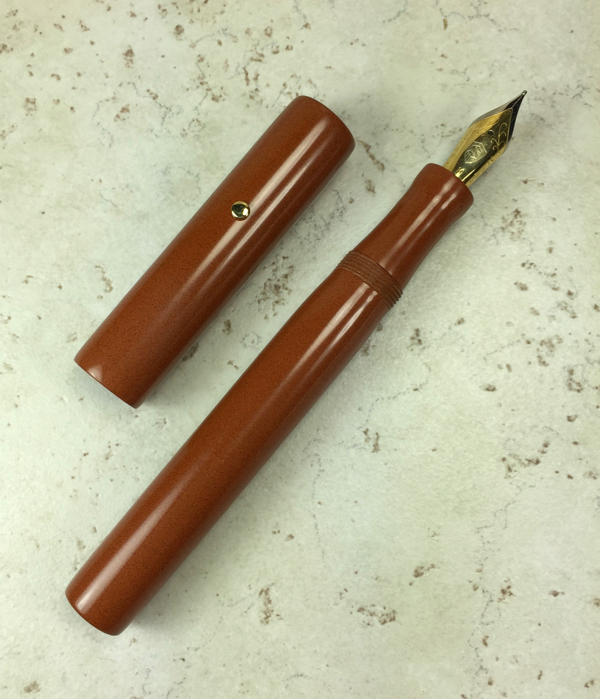 This blank’s creation resulted from the scarcity of a gorgeous celluloid used by the Tibaldi pen company. The challenge was to make a blank that replicated the bright pop of blue in a network of grey and black like the original. Yet another blue pen was made this week, a small Idyll in Arctic Fog Vaper Swirl. As a special commission for a little boy, the parents chose blue, his favorite color, and had a custom clip made that had an image of his favorite stuffed toy, a fluffy chicken. It’s hard to tell in the picture, but it does look just like the little chick. The parents commissioned a 2nd pen, as well. This is a small Zephyr, a flush barrel, cigar shaped style. 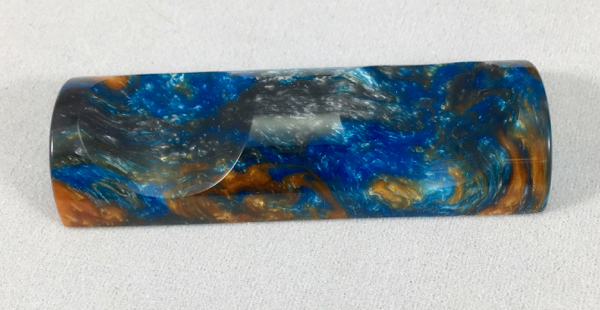 The material is Beach Walk Vaper Swirl, with the blanks carefully chosen to have the most blue possible. It’s impossible to know exactly how a blank will look after it is turned down, but generally one can look at the raw, unturned blank and tell which colors will be predominant. Some customers, who know exactly what they want, ask to choose the blanks themselves. This is true for the commissioned pen below, a medium sized Zephyr in Fire Nebula Lava Explosion. The customer wanted blanks that had the golden caramel as the main color, with the blue and purple accents still apparent. 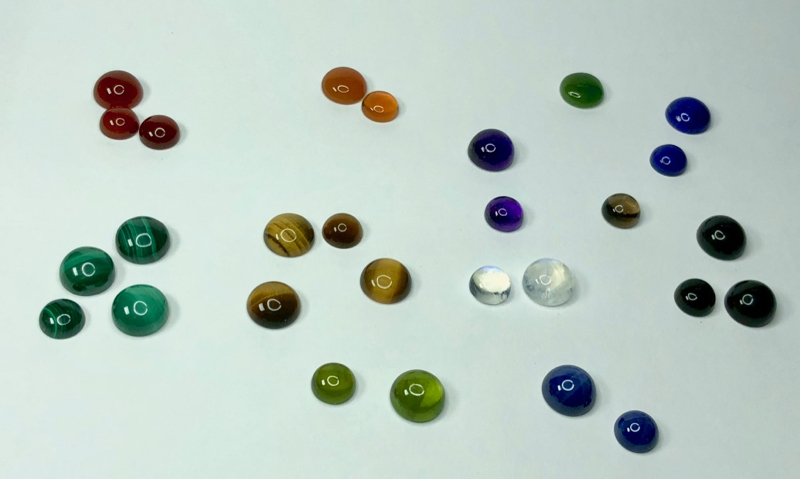 I provided pictures of about 8 or 9 blanks, from which the customer made his selection. I’ve also had clients ask for this same blank, but with the purple as predominant. 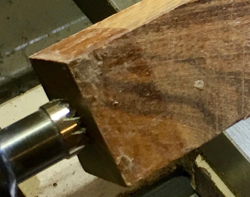 It’s all about customizing as much as possible at Scriptorium Pens. The Zephyr below was originally intended to be in Orange Japanese Ebonite, but the day before I was scheduled to start work on the pen, the customer asked if he could possibly switch to Orange Ripple Ebonite. I was able to accommodate the request as I had just serendipitously received a shipment that included some Orange Ripple. As you can see below, the material boasts a gorgeous, dark ripple pattern with highlights of bright orange to spice it up. A silver Shield Logo roll stop completes the sleek look. The next few pens in the work queue will be very different from this recent batch, both in materials and styles. One of my favorite aspects of custom pen making is that every day is different, and no pen is exactly like another. There’s no time to get bored, nothing repetitive in the creation process. Every single day it’s exciting to open that shop door and get to work. See you next time with some new pens! 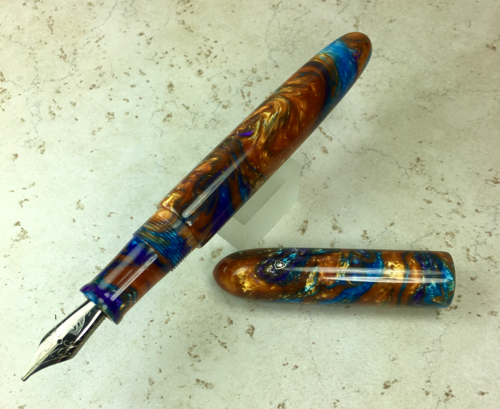 It’s time for a new pen model at Scriptorium Pens! Following several customer requests, the Aeterna was created. Inspired by the timeless style of the flat-top ebonite pens of the late 1800’s & early 1900’s, the Aeterna features sleek lines, a very slight curve behind the barrel threads, and an elongated 23mm section with a classic, lipped grip for writing comfort. 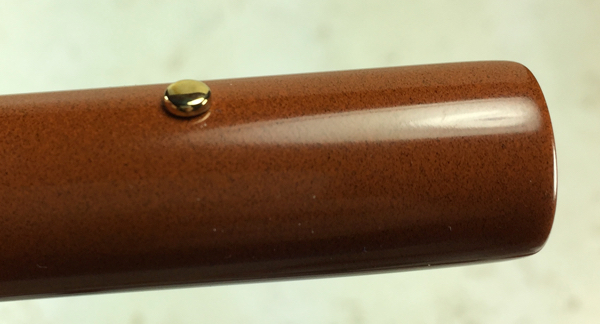 The Iota button roll stop was created specifically to go with the Aeterna to add to the elegant, minimal look. The Iota is the first Scriptorium roll stop to be offered in 18k gold, as well as Sterling Silver, Bronze, & Brass. As always, customers can choose other roll stops or clips to go with their custom pens. I love seeing the ideas customers come up with for new pens. Keep those ideas coming, and your idea might become a regular Scriptorium Pens model, too!